"Do you believe now," Pagadan challenged, "that this task is worthy of the efforts of a Vegan Zone Agent and his shipload of specialists?" "I've been afraid of that right along," Iliff said without enthusiasm. "But look, you seem to know a lot more about Galactic Zones than you're really supposed to. Like that business about our shipload of specialists — that kind of information is to be distributed only 'at or above Zone Agent levels.' Where did you pick that up?" "On Jeltad — above Zone Agent levels," Pagadan replied undisturbed. "Quite a bit above, as a matter of fact! The occasion was social. And now that I've put you in your place, when do you intend to investigate Deel? I've become casually acquainted with him and could arrange a meeting at almost any time." "Agent of Vega" is James H. Schmitz's first science-fiction story for Astounding, and it is a doozy: subtle, carefully delineated, a tight novella packing enough action and thought-material for a novel. This is the first and longest of the four stories in the Agent of Vega series. The Confederacy of Vega is a far-flung interstellar government whose main trouble-shooting arm is the fabulous Department of Galactic Zones. Iliff is a Zone Agent, one of the most powerful instruments that the Confederacy can deploy. An unprepossessing fellow, human, extremely tough and competent. She smiled suddenly and became with that, he thought, extraordinarily beautiful, though the huge silvery eyes with their squared black irises, which widened or narrowed flickeringly with every change of mood or shift of light, did not conform exactly to any standard human ideal. No more did her hair, a silver-shimmering fluffy crest of something like feathers — but the general effect, Iliff decided, remained somehow that of a remarkably attractive human woman in permanent fancy dress. According to the reports he'd studied recently, it had pleased much more conservative tastes than his own. Zone Agent Iliff knows what Pagadan, for all her high social connections as a kind of Lannai royalty does not: that the secret "shipload of specialists" consists of a Zone Agent and his robot-controlled starship. An agent has many disguises as well as great mental powers, and the ship is fast and well-armed as well as intelligent in its own right, but that is all. It is quite a lot really. There are only a few significant characters in the plot, but since the two chief villains each are doubled, that is, in dual guise — dual mental guise, not physical — and since each villain has several names or nicknames — and since the relationship between the two villains requires some ferreting out — please read as slowly as you may. Schmitz does not at all hammer home these points. I considered drawing up a little chart to show the relationships for this review, as stage-plays and some long novels begin with helpful character lists. But after all, figuring it out and then appreciating it is part of the fun. Make no mistake about these being substantial villains. Again, Schmitz does not hammer it home, but these are blood-chillingly bad and vastly dangerous. As is common with Schmitz's heroes and heroines, both Zone Agent Iliff and Pagadan possess great power and subtlety of mind, and great personal courage. These are individual heroes, and they matter. James Schmitz discovered Edward E. Smith's Lensman series in Astounding as a teenager in 1939. Schmitz's conception of mental natures and operatives, beginning in "Agent of Vega", clearly owes a lot to Doc Smith's Lensmen. Additionally, fans of Smith's Galactic Patrol may note a specific parallel in the action. Schmitz wrote the Introduction to Ron Ellik's and Bill Evans' guide, The Universes of E. E. Smith (1966). He doesn't talk about his own work there, but his great respect and appreciation for the Lensman novels is very clear. The Confederacy of Vega's administration, like Smith's Lensmen and like the Overgovernment in Schmitz's later Federation of the Hub stories, is efficient with force both physical and mental, ethical after its fashion, but always focused on keeping humanity alive in an often hostile and unpredictable environment. 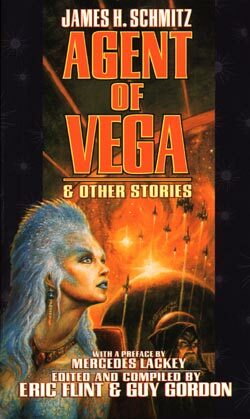 The "Toeller-Worm" emergence is given only a couple of background paragraphs in "Agent of Vega". This may be partial explanation for the interstellar worm weather phenomena in Schmitz's great novel The Witches of Karres. Pagadan the Lannai features also in the following Agent of Vega story of the Department of Galactic Zones: "The Illusionists" (or "Space Fear"). So there we have it: a fine science fiction story, an exotic action-adventure. 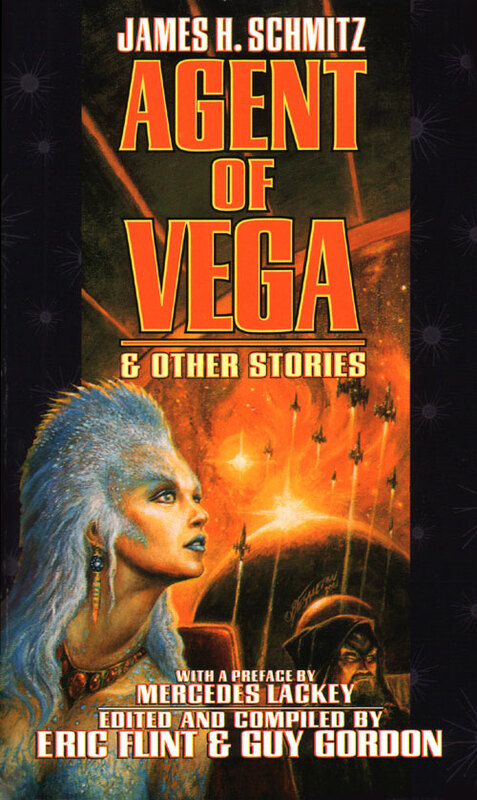 My first readings of "Agent of Vega" were in my teens; I read it at adventure pace and always enjoyed it. But if you let yourself take your time, read it slowly, reread it after a while, you will see more of its subtle riches. I still am discovering them.